At the Fence: LUVS Diapers! The Clue is in the Blue! Luvs has a NEW, super absorbent diaper! It is available at your local Walmart store. Just look for the blue seal that lets you know they have the 15% more absorbent leakguards. After 6 children I know how important leakguards are! How many times we had them all dressed and ready to go somewhere and then had to change the whole outfit before even heading out the door. Now, I know when I shopped for diapers I tried to be thrifty and not spend too much, but I also wanted my baby comfortable. Luvs gives you the ability to do this. Their diapers have an ultra absorbent core to draw wetness away from your baby's delicate skin. The gathered leg barriers help prevent leaks, while the stretch sides give maximum comfort and fit. 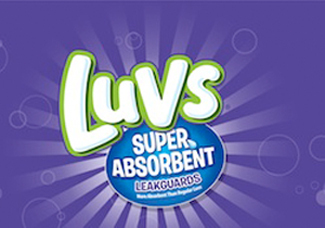 So if you are looking for a great diaper at a reasonable price check out the new Luvs Super Absorbent Diaper. Also, be sure and get social with Luvs to stay on top of new product, specials and even the occasional sweepstake. They can be found on Twitter-HERE and on Facebook-HERE. Disclosure:This is a sponsored post for SheSpeaks/Luvs. I will be compensated for this post.